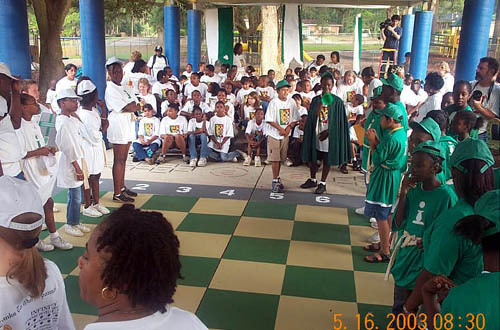 Tallahassee's Pineview hosts "Chess Challenge"
The "Sunshine" state of Florida is where vacationers often go for hot fun in the summer time. However, the Florida sun was frowning a bit on this 16th of May. 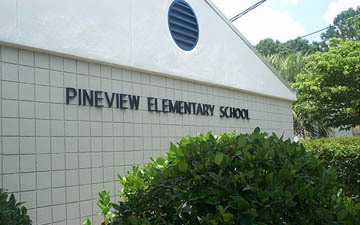 With overcast skies and clouds looming overhead, the 2nd annual "Chess Challenge kicked off at 7:30am at Pineview Elementary School in the capitol city of Tallahassee, Florida. 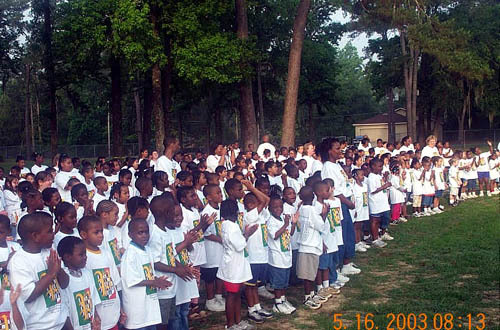 The K-6 school had the participation of all 500 students and Principal Dr. Marilyn Jackson-Rahming gave a spirited charge as the participants lined up for the group shot. 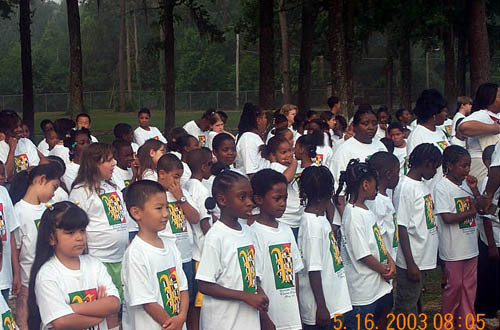 All were "decked out" in their colorful t-shirts designed by two of the students! 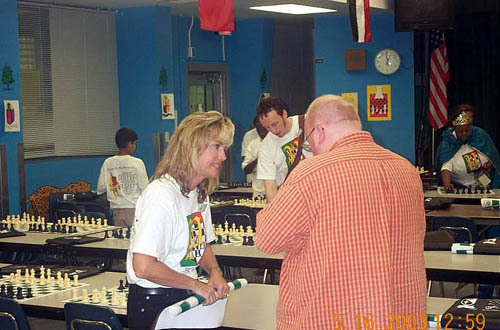 Earlier in the week all rooms were visited and the students watched an instructional chess video and was under the supervision of a volunteer coach. 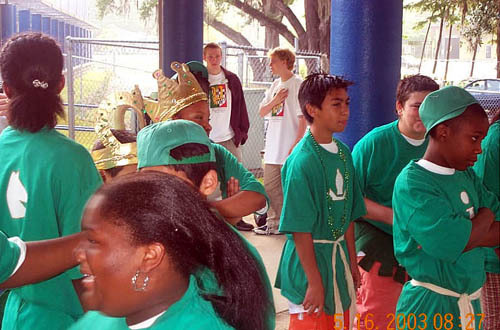 The first activity was the "live chess game" in which students acted as chess pieces as the moves were called out by student players (two per side). Everyone else watched and seemed to enjoy the action. Sometimes the acting students walked to the wrong square and laughter would break out. 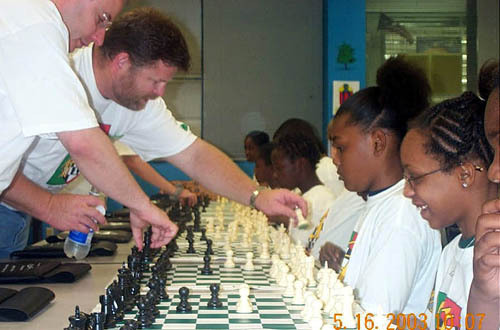 The main activity was the Chess Challenge. 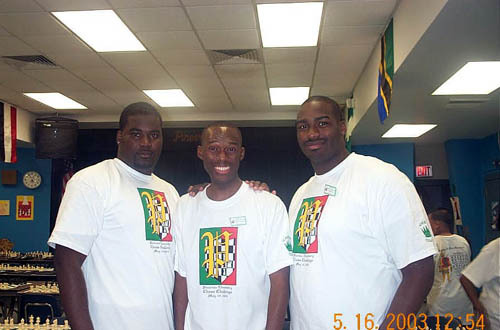 In this event, about 60 boards were set up and 125 students would come in four shifts to play the volunteers. 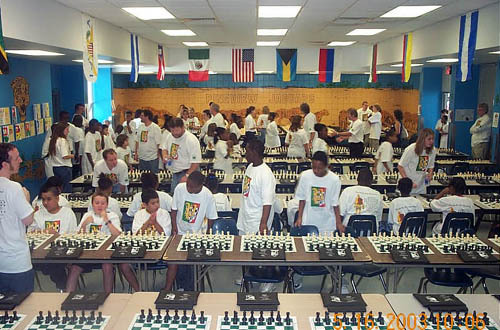 It was such a beautiful sight to see the students sit down for the very first time to play a game of chess. 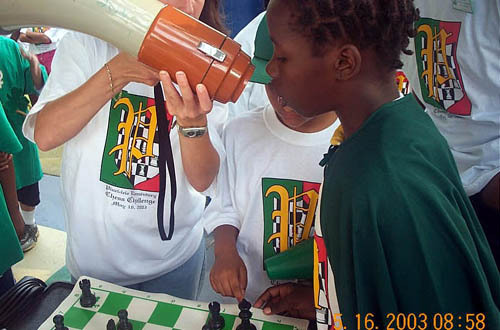 Many of the students insisted on moving the rook in an "L" shape, or making up new rules for chess. 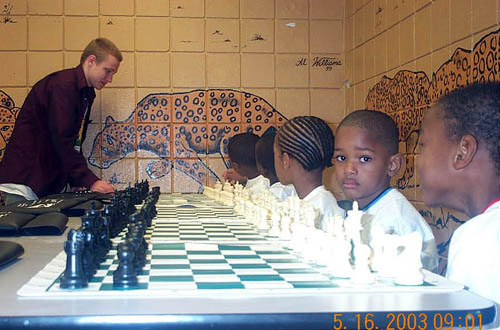 Nevertheless, the young chess players appeared to enjoy themselves as laughter frequently filled the cafeteria. The Chess Challenge lasted from 9am-1pm and was a rousing success. The bulk of the credit goes to the tireless efforts of Sue Lelli (last picture) who organized the event for the second year in a row. 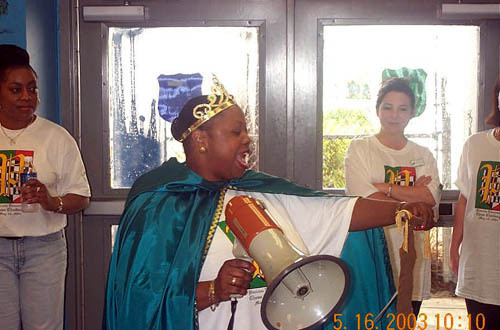 In addition, praise goes to the Principal, Dr. Jackson-Rahming (above with bullhorn) who saw to it that the event had the resources it needed to be successful. 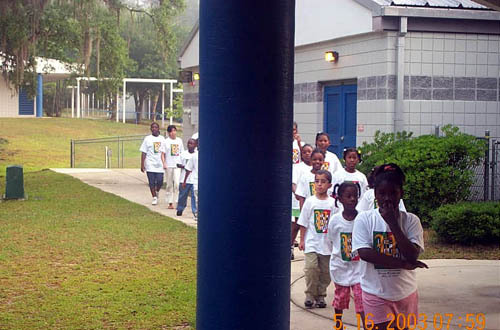 There were many sponsors and volunteers from the Tallahassee community including parents, teachers and chess players. An enjoyable time was had by all and enthusiasm was certainly a sight to see… quite a memorable day!